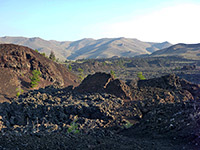 Like most NPS units that contain volcanic landscapes, there are relatively few maintained trails in Craters of the Moon National Monument, though cross country hiking is permitted in most areas. The one extended path is the 4 mile Wilderness Trail past Big Cinder Butte and Echo Crater, starting at the far south end of the scenic drive, but best of the shorter hikes is probably the North Crater Trail (1.8 miles), which passes four craters of various sizes, together with lava flows, cinder cones, a lava cave, and a group of spatter cones; these latter are beside the southernmost of the two trailheads. Both start and end points are next to the scenic drive, so a loop could be made by walking back along the road, though there-and-back is best, because the road has no verges, and the distance between the two trailheads is half a mile longer. 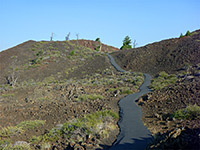 Different parts of the North Crater Flow Trail have views in all directions, and as the path rises quite high (350 feet) above the generally flat surroundings, the hike is the best choice for an overall perspective of the national monument. Map of Craters of the Moon National Monument. 13 views along the North Crater Trail. The path starts in the north just beyond the shorter and much busier North Crater Flow Trail, which loops over mixed aa/pahoehoe deposits produced by the crater. 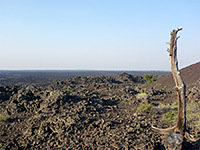 The North Crater Trail ascends ashen slopes on the north side of the peak, past a good viewpoint of lava fields to the northwest, then climbs a little more to the edge of a satellite crater, which is relatively small, but is soon followed by a second, larger vent. A short but steep descent leads to a flat flow of ropy (pahoehoe) lava, enclosed on three sides by colorful, jagged rocky hillsides. The next section is marked by posts, crossing the lava and coming close to the entrance of a little lava cave, then up the slope on the far side, round a few bends and up another stark black ash hill to the next crater, one of three known as the Big Craters. The final stretch is along the western rims of each crater, over the far side and down, the path now paved, to the southern trailhead beside the Spatter Cones. These are a group of small, irregular sided vents, three of which are visible from the path; others are found close by but are not easily viewable since off-trail walking is not allowed in this location in order to protect delicate natural features. Even though the path to here from the southern trailhead is very short (240 feet), it still has a notice common to all hikes in the national monument giving precise information on every facet of the trail including gradient, width, surface and obstructions.